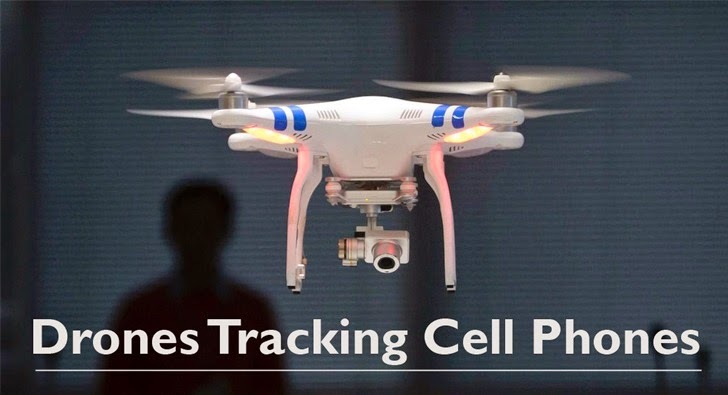 Do you know, apart from United States National Security Agency (NSA), Federal Bureau of Investigation (FBI) and law enforcement, a few advertising companies are also monitoring unsuspecting users' cell phone data with the help of the unmanned aerial vehicles (UAVS) called Drones. Yes it’s True! A Singapore-based advertising firm AdNear, which described itself as "the leading location intelligence platform," is using a number of small drones flying around the San Fernando Valley in Los Angeles since early February in order to track Wi-Fi and cellular transmission signals. Generally, the reason behind spying on people's cell phone signals is the company’s interest to deliver hyper-targeted advertisements to the users, which is not at all surprising as these ad companies do every effort to gather users’ information. "The usage of drones for location data collection would tremendously reduce human intervention and ease the process of collating data in inaccessible regions. … We are talking a new level of scale altogether," the description reads. "For us, this means a ton of fun!" The advertising firm told VentureBeat that it’s the first time when an Adtech company has employed drones in an effort to collect users’ wireless data. According to the director of marketing and research, Smriti Kataria, the collected data doesn’t involve conversations or personally identifiable information. Rather it just uses signals against the nearby towers or Wi-Fi hotspots, cell tower triangulation, and other indicators to determine users’ device location, which is then used to map the user's travel patterns. AdNear spokesperson confirmed that they currently have over 530 million user profiles covering various Asian markets for its other location-based campaigns. Two years back, we reported about similar privacy concern that how retailers are tracking users across the malls while shopping and even outside the store using the WiFi antenna built into users’ smartphone. Basically, when a user comes within the range of a properly configured WiFi access point, the retailers record the wireless MAC address of his/her smartphone, which is a unique 12-digit number and every time they pass by, that WiFi access point can log that number. Not just these advertising firms are spying on us. Drones and Device tracking techniques are also in use from several years for hacking and spying purposes by various Intelligence Agencies. Device tracking is not at all a new or a different concept. Last year, Edward Snowden documents revealed that the Canadian spy agency tracked Airline travelers by capturing their device identification from the free Wi-Fi service at a major Canadian airport, even days after they left the terminal. About a year ago, London-based Sensepoint security researchers developed a Snoopy drone that was able to intercept data from users’ Smartphones using spoofed wireless networks. Spoofing WiFi networks that device has already accessed allows Snoopy Drone to connect with targeted Smartphone without authentication or interaction. No doubt, AdNear drone campaign is working towards an innovative idea, but it becomes clear that more explicit regulations are necessary to ensure the average citizen’s privacy.